All of our glass ornaments and votive holders come in gift boxes. The boxes are silk covered on the outside and padded on the inside to protect the product. They add to the value of each piece providing a beautiful gift presentation and the perfect solution for both storage and shipping. Each color is chosen to complement the design of the piece inside. 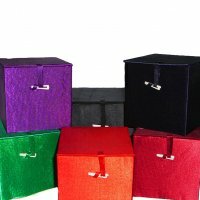 The colors of the boxes vary and cannot be specified except in custom and name drop designs orders.